We have found historical treasure in a scrapbook carefully created and organized by the late Florence (Beer) Willis, sister to Jim, Arnold and John Beer and beautifully preserved by Florence’s daughter Lillian (Willis) Bentley. 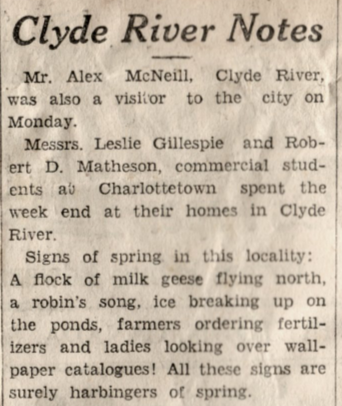 Although scrapbookers of this era seemed to focus predominantly on weddings and funerals, we found among the highs and lows, newspaper clippings called “Clyde River Notes”. Now, we may have been under the impression that we were the first generation to carefully document the “goings on” in Clyde River, but this has now been disproven. Details of life in Clyde River in the 1920s and 1930s are described in such flowery detail that one can easily conjure up the images despite the absence of digital photography. It can also be confirmed that we inherited our sense of humour honestly from our ancestors with their tongue-in-cheek writing in appropriate English prose. We have enough to create a short series of writings, so here is the first of the excerpts from Clyde River Notes brought into the 21st Century. May this inspire you to search for your own Clyde River treasures to share on our website. Mr. Alex McNeill, Clyde River, was also a visitor to the city on Monday. Messrs. Leslie Gillespie and Robert D. Matheson, commercial students at Charlottetown spent the week end at their homes in Clyde River. Signs of Spring in this locality: A flock of milk geese flying north, a robin’s song, ice breaking up on the ponds, farmers ordering fertilizers and ladies looking over wall paper catalogues! All these signs are surely harbingers of spring. Great quantities of logs being moved to the several mills in this vicinity, to be sawed into building material, testify to the prosperity of our farmers who are still able to “carry on” notwithstanding the prevailing low price of potatoes. Mr. Fred’k Beer, Clyde River and Mr. Ira C. Auld, Kingston were in Charlottetown on Monday with great loads of hogs for Messrs. Davis and Fraser. With the present excellent price, it is quite remunerative to “tell it” with hogs. Mr. Harold Murray of Regina, Sask, who is spending the winter in Clyde River with his mother, Mrs. Angus Cameron and other relatives and friends was a visitor to Charlottetown last week. Mr. Murray intends returning to “the land of smiling wheatfields” in the near future. Much credit is due Prowse Bros., and the management of CFCY for the splendid programme of old time music broadcast on Monday evening. The performing artists, who are really masters in their several lines have many friends and admirers in Clyde River. Miss Ina Livingston, Clyde River, was a visitor to Kingston on Tuesday the guest of uncle and aunt, Mr. and Mrs. Duncan Marshall. We are sorry to know that Mrs. Marshall’s mother, Mrs. George Beer (Sr.) is indisposed and we hope that this remarkable lady who is over the four score mark may soon regain her usual splendid health and strength. The rate payers of Clyde River School have provided an excellent case to hold the books for the School Days library made possible through the generosity of Mr. Adam Andrew, San Francisco, California. Mr. Andrew spent part of his childhood days at the “Bannockburn Mills,” Clyde River, and when he revisited the scenes of his boyhood last summer, he was able to recall vividly happenings of the old days, which seem to fill quite a large part of his affections. So pleased to read the old newspaper articles. I remember reading Margaret Dixon’s ‘Ellen’s Diary’ and Audrey MacPhee’s “Along Rural Routes” years ago. It was interesting to see so many names from long ago that have been passed along to their descendants today.